Lake Metonga Association and Forest County Association of Lakes Members Harry Resch and Les Schramm received recognition from Andy Space, the Crandon High and Middle School Principal and from teacher Mrs. Edlund at a November 2013 Crandon School Board Meeting for conducting a lake outing on Thursday, October 26, 2013. The ecology class from Crandon High School with their teacher, Mrs. Cindy Edlund, met the association members on Lake Metonga. There were three stations set-up to have parts of the class rotate to observe things about the lake. One group met with R. T. Krueger of the Northern Lakes Service at the outlet of the lake, the start of Swamp Creek, to study aquatic insects and the diversity of the insects in the river. Another group went out on the lake with fish biologist Mike Preul, with his shocking boat to see various types of fish located in the lake. The third group went out on the lake with a pontoon boat driven by Harry Resch with Les Schramm narrating the trip and showing the invasive species of Eurasian Water Milfoil and Zebra Mussels that have infested the lake. Each group rotated so that all the students were able to see what was going on at each station. The students were very attentive and learned a lot about the things that are going on in this Northern Wisconsin lake. Mrs. Edlund and the School District of Crandon appreciated and paid tribute to the associations at the school board meeting in November. Both associations would like to continue this in the future with the possibility of getting Crandon, Wabeno and Laona students involved. 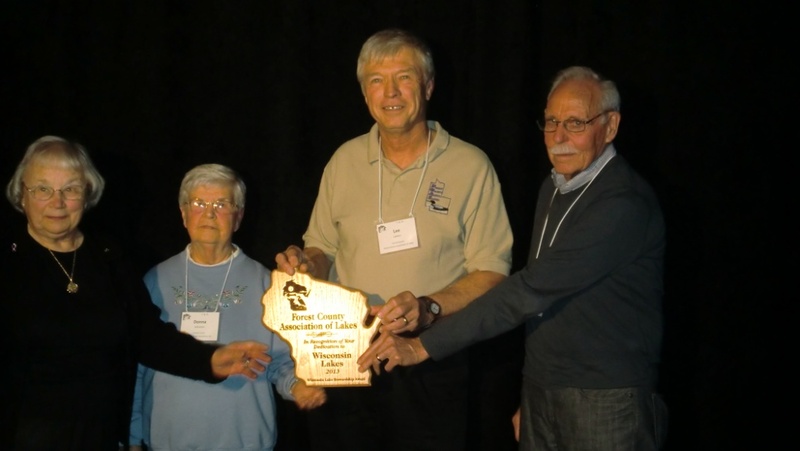 The Forest County Association of Lakes (FCAL) is a 2013 Wisconsin Lake Stewardship Award Recipient in the Group category. Lee Lamers accepted the award on the Association’s behalf, which was presented by the Wisconsin Lakes Partnership at the Wisconsin Lake’s Partnership Convention in Green Bay on April 10, 2013. For over twenty years, FCAL has provided a strong voice for protection of lakes in the county, full of members who are passionate about lake protection. While some Forest County lakes do suffer from problems with invasive species, FCAL’s main emphasis has been and continues to be lake protection through education and prevention, along with advocacy wherever its members see that they can make a difference. With isolated lakes situated in the deep woods of the Nicolet National Forest, Forest County is a unique place, and its residents have developed a unique sense of stewardship towards their lakes and surroundings. FCAL is a vital force in the protection of the county’s lake resources and all the benefits they bring, making it a worthy recipient of a Wisconsin Lake Stewardship Award in the Group, Multiple Lakes Category.